Ronald Wayne Garrett was born on December 3, 1947 in Brooksville, Florida. The Red headed, five foot eleven infielder was known as “Red” & Huckleberry Finn. Garrett was a left handed hitter that threw right handed. He played baseball at Sarasota High School, getting selected by the Milwaukee Braves in the sixth round of the 196 draft. His two brothers; Henry Adrian Garrett & Charles James Garrett were also signed to the major leagues. Charles did not make it to the big leagues. Adrian Garrett played for the Atlanta Braves (1966),Chicago Cubs (1970/ 1973-1975) Oakland Athletics (1971-1972) & California Angels (1975-1976). Adrian was mostly as a reserve outfielder, batting .185 lifetime with 51 hits 11 HRs 8 doubles 37 RBIs & a .263 on base % in 163 career games. 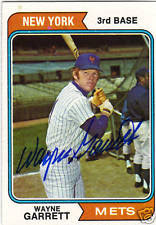 Wayne played in the Florida State League right in his hometown at Sarasota, Florida. In 1968 the Braves left him unprotected & he was picked up by the New York Mets as a Rule V player for $ 25,000. It was the only off season deal the Mets made going into 1969. Due to the fact that Bud Harrelson was still recovering from off season surgery, Garrett got a chance to play right away. After proving himself in Spring Training he made the 1969 roster. Garrett was a nervous wreck when he arrived in New York, having never been to big city before in his life. He said he wasn't nervous at the plate but on the field his hands felt like iron. He got his first career start in the fifth game of the season at Shea Stadium, against the St. Louis Cardinals. In his first at bat he walked & the second time up he singled to right field off Dave Guisti. The next day he doubled off St. Louis Cardinals future Hall of Famer; Bob Gibson. Garrett played in ten games the first month batting .267 by the end of April. He soon found himself filling in for players who were either hurt or on military reserve. Gil Hodges inserted him in the lineup at third base in early May & it was at that position that he would see the majority of his time. He would be a platoon player with veteran Ed Charles, mostly against right handed pitchers. Garrett played in 72 games at third base, 47 games at second & nine games at short stop. Gil Hodges said Garrett was one of the biggest surprises of 1969, the media & his teammates also agreed. Sportswriter Jack Lang said Garrett was the best bargain New York had since buying Manhattan Island for $24 from the native American Indians. At first it seemed the Mets may have finally found a steady third baseman that they sought after for so many years. But in reality the Mets were always trying new experiments & would make many bad trades in the future trying to find a replacement for Garrett as well. The two worst moves of that era, in which the Mets were seeking a third base replacement were the trades of Amos Otis for Joe Foy & Nolan Ryan for Jim Fregosi. After all these years, with the 150 plus third baseman that have played for the Mets, Wayne Garrett is the only Mets third baseman to have played in two World Series. In May 1969 Garrett hit his first career HR, it came against the Cincinnati Reds Jim Ray at Shea Stadium. That month he also raised his batting average over .300. In a May 11th game he tied a National League record by walking twice in one inning. The first walk came as the second batter of the inning off the Astros Don Wilson, he later scored on a wild pitch. He later walked as the tenth batter in the inning, and his walk brought home Bud Harrelson with the sixth run of the inning. On June 4th the Mets & Dodgers were in a scoreless game going into the 15th inning at Shea Stadium. With one out & Tommie Agee on first base, Garrett singled to centerfield. The ball got by Willie Davis & Agee came around to score with the walk off exciting win. On June 8th Garrett's 8th inning single in San Diego was the Mets go ahead run, as he helped Tom Seaver to a 3-2 win, the ninth victory in his first Cy Young season. On July 2nd, he helped the Mets beat the Cardinals in St. Louis 6-4, with four hits while driving in four runs. 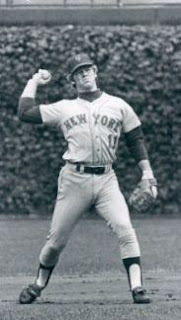 On July 9th he played two innings as a defensive replacement in Tom Seaver's imperfect game, where he lost his no hitter with two outs in the ninth inning. 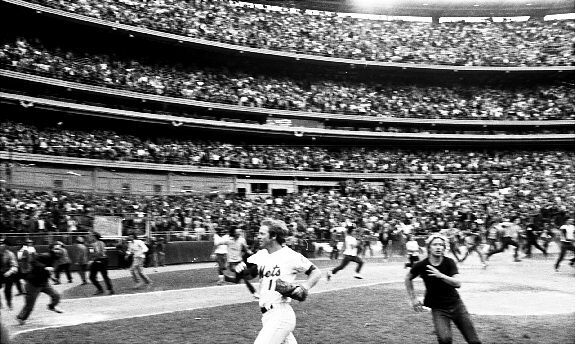 On September 8th with the Mets playing a huge game against the first place Chicago Cubs at Shea Stadium, Garrett broke a 2-2 6th inning tie. His single off Cubs ace Bill Hands proved to be the winning run and put the Mets just 1.5 games out of first place. Garrett also drove in eight runs during the September stretch drive leading to the Mets winning their first NL Eastern title. In 124 games for the 1969 World Champions, he batted only .218, but walked 40 times, with 11 doubles 3 triples 39 RBIs and 38 runs scored. He also tied for the team lead with five sacrifice flies. Defensively at third base made only eight errors in 115 attempts, posting a .951 %. 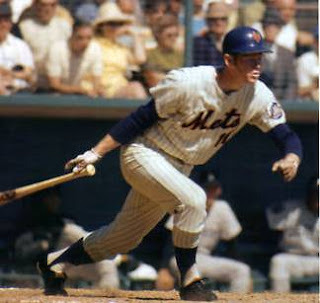 1969 Post Season:1969 NLCS: In the 1969 NLCS against the Atlanta Braves he played in all three games batting .385, going 5 for 13, with three walks. He opened up the Series getting two hits & a walk in Game #1 at Atlanta Fulton County Stadium. In Game #2 he got two more hits, including an RBI single off Milt Pappas to put the Mets up 6-0 in the 3rd inning. He also drew another walk as well. 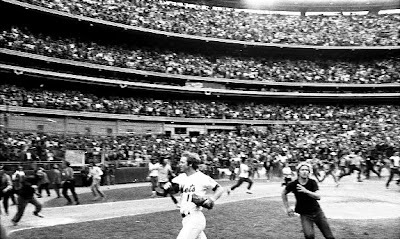 In the Game #3 clincher at Shea Stadium, he hit a two run HR off the right field foul in the fifth inning. The Mets were behind 3-2 at the time & the HR off Braves pitcher Pat Jarvis, put the Mets ahead for good. Garrett had a huge game, hitting two doubles, while driving in three runs, & scoring three other runs. In the Series he had five hits (second best on the club) coming in third behind Cleon Jones & Art Shamsky in batting (.385). He posted a .769 slugging %, with one HR two doubles, two walks & three RBIs. The final out was made when Tony Gonzales grounded out to Garrett & he threw him out at first base. He also was a defensive replacement in Game #4 of the World Series at Shea Stadium. Overall he was 0-1 with two walks in Game #3 at Shea Stadium, against the Baltimore Orioles. After the World Series he enjoyed the success & acknowledgment the Amazing Mets were receiving. He was having a ball as a single guy in New York City with all the night life had to offer. He even made an appearance on The Dating Game TV show with Rod Gaspar & Kenny Boswell. After the Championship season, main third baseman Ed Charles retired. The Mets didn't have enough confidence in Garrett to be an everyday third baseman. In one of their worst trades ever they sent top hitting prospect, Amos Otis to aquire Joe Foy to be the main third baseman. Foy never fit in on the ball club & his drug problems certainly did not help his case. In 99 games he hit .236 with 6 HRs & 37 RBIs, Foy was gone by the next season. Otis went on to a great career in the AL with the KC Royals. Garrett played in 70 games at third base & 45 games at second base in 1970. At the plate Garrett struggled at first, not getting to the .200 mark until the first week of June. But then he hit safely in 15 of 18 games batting .429 in that stretch, getting his average over the .300 mark. 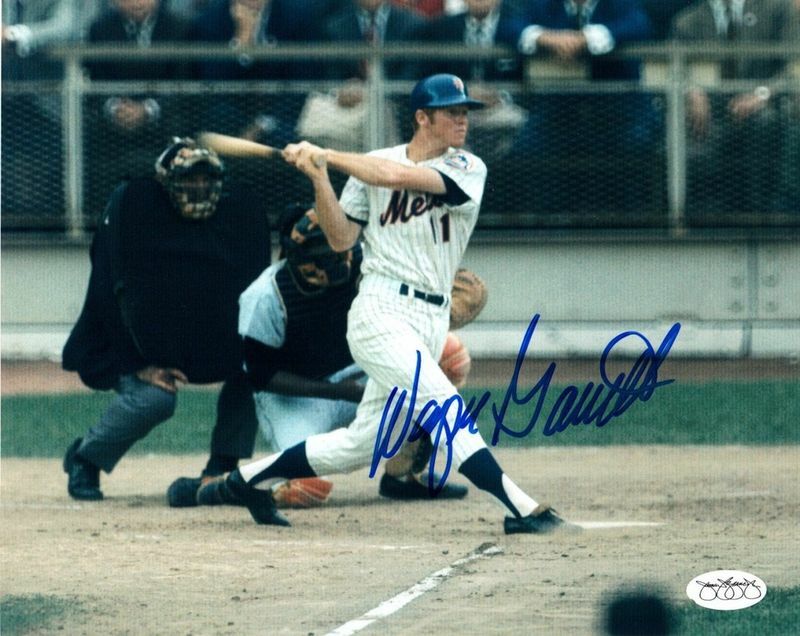 On June 9th he hit his second HR of the season, it came at the Houston Astrodome & helped Tom Seaver to a 2-1 win. On June 14th he hit a two run HR off Par Jarvis, whom he had also hit a HR off of in last year's NLCS. The 5th inning two run shot tied the game in which New York went on to win. On July 26th he hit a pair of HRs against the Dodgers at Shea Stadium driving in all the Mets runs, although they lost 5-3. Strangely he was pinch hit for late in the game, with Tommie Agee who grounded into a double play. Four days later Garrett hit another HR, this time off the San Diego Padres Pat Dobson. The HR was the Mets third in the inning, coming right after Cleon Jones had just blasted one as well. He drove in ten runs in the final two weeks of August, and he capped off a six game hit streak with a four hit day on September 1st in St. Louis against the St. Louis Cards. September 28th at Shea Stadium, he hit a dramatic three run walk off HR, off future Hall of Famer Hoyt Wilhelm, to beat the Chicago Cubs 6-3. In the month of September he drew walks in 17 of the 27 games he played in. 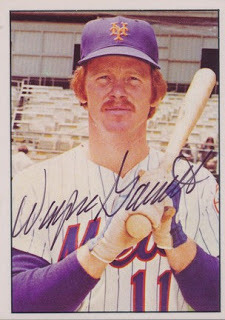 He finished the year with 81 walks, second on the club to Bud Harrelson. Garret posted the team's best a on base % (.390%) although he batted only .254. On Overall on the season, Garrett showed some power hitting 12 HRs (third best on the club) with a .421 slugging %, 17 doubles 45 RBIs & four triples. In 1971 after Joe Foy was sent away, the Mets got Bob Aspromonte to play at third base, as the top brass still felt Garrett wasn't their man. On the field Aspromonte led all NL third baseman in fielding, although at the plate he hit .225 with 5 HRs & 33 RBIs in 97 games. As for Garrett his season began serving time serving in the military reserves. He played in only 56 games overall, batting .213 with one HR & 11 RBIs. At the start of the 1972 season the Mets made another horrible trade, sending Nolan Ryan to the California Angels in exchange for third baseman Jim Fregosi. Fregosi's best days were behind him & he was gone by early the next season. Fregosi & Garrett split time at the position, with Garrett playing in 82 games. He out played Fregosi at third,as well as with the bat. Garrett made nine errors, posting a .960 fielding % (4th best in the NL), while Fregosi made 15 errors (.935 field %) in 85 games. Fregosi who came to New York mostly because of his bat, only hit .232 with five HRs & 32 RBIs in 101 games. Meanwhile Garrett hit just .232 but posted a .374 on base % mainly due to his 70 walks (9th most in the NL). He also hit two HRs with 39 RBIs in 111 games. Garrett didn't begin to see action until the end of April & didn't see steady playing time until June. By September he was seeing the majority of the playing time at third as Fregosi got injured. Garrett began the month with a day in Houston, where he drove in three runs in an 11-8 Mets win against the Astros. On October 2nd, Garrett singled in the bottom of the 8th inning in a scoreless game against the Montreal Expos. Although they tied the game the Mets went on to win it on a Dave Schneck RBI single. On the month Garrett had six multi hit games & raised his average 16 points. The 1973 Mets season began with Fregosi as the third baseman, but by early July he was batting .230 without a HR, and he was gone. Now the third base job was all Garrett's. If only the stupid Mets brass had seen this two years prior, they may not have made those terrible trades that hurt the clubs future. 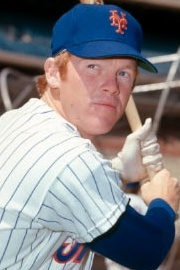 Garrett quickly proved to the organization that he was the guy for the third base position in the 1973 N.L. Pennant winning season. Garrett would put in his best offensive season in 1973, posting career highs in HRs (16) which was second on the club to John Milner. He also posted career bests in hits (129) doubles (20) RBIs (58) runs scored (76) & slugging (.403%) all of which were third best on the club. He became a Shea fan favorite as well, having one of his best regular seasons. 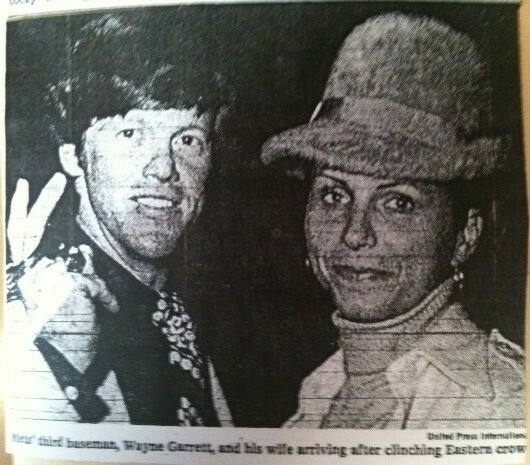 The red headed Wayne and his beautiful wife Donna became very popular around Shea Stadium & on the New York scene. Donna Garrett became the leader of the Mets wives club & head of various charity events. He would find himself atop the batting order eventually batting in the leadoff spot. On the slow footed ball club, Garrett led the team with six stolen bases. In mid May, from the 12th through the 18th he hit three HRs, drove in six runs with eight hits. On May 18th, his two run HR & three RBI game, helped him lead the Mets past the Pittsburgh Pirates 4-3. In the middle of June another hot week had him drive in eight runs, including a three run HR at Shea Stadium on June 15th, helping to beat the San Diego Padres 5-2. On July 1st in the first game of a double header at Wrigley Field, he hit a three run HR off the Chicago Cubs Hall of Famer, Fergie Jenkins leading the Mets to a 6-5 win. Garrett had a fantastic month of September helping the Mets win the NL East after being in last place at the end of August. 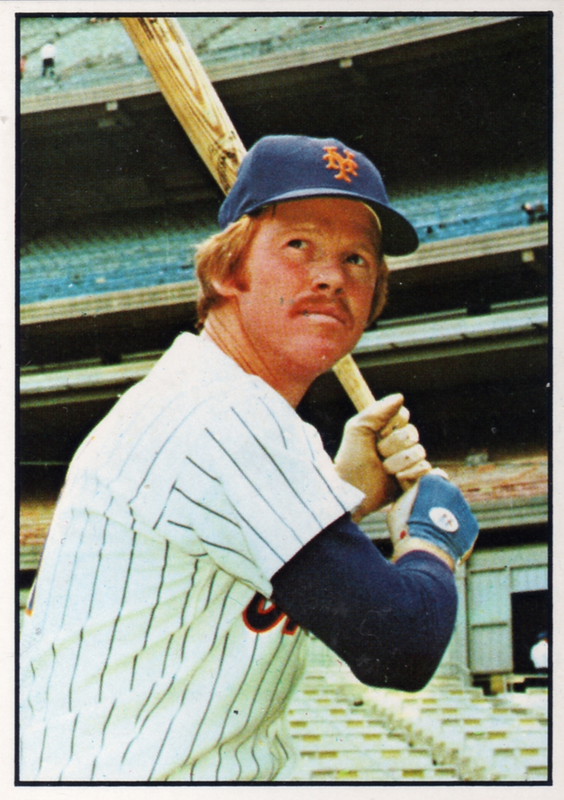 '73 Pennant Race: In the final month he hit .333, with 29 hits, six HRs, five doubles 17 RBIs, and a .407 on base %. From September 4th through September 7th he hit two HRs driving in four runs all contributing to Mets wins. On September 7th in Montreal, he hit a HR off former Met Steve Renko, driving in the only run of the game. The 1-0 win helped the Mets pass the Expos in the pennant chase. On September 12th he put the Mets on the board with a HR at Veterans Stadium in Philadelphia, leading Jon Matlack to a 3-2 Mets victory. Garrett would drive in runs in five of the next six games, all of which were Mets victories. The Ball Off the Wall Game: On September 20th he played a big role in one of the biggest defensive plays of the season. Garrett was at short stop & took a relay throw from Cleon Jones on ball the Pirates Dave Augustine hit that bounced off the top of the wall. With the score tied, Richie Zisk was trying to score the go ahead run from first base. Garrett took the relay & nailed Zisk at home plate with the throw. Catcher Ron Hodges would single home the game winning run in the bottom of the 9th. The Mets win brought them within a half game of the first place Pirates. 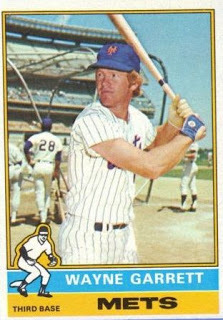 The next night, September 21st, the Mets over took the Pittsburgh Pirates for first place, in the Mets big 10-2 win at Shea over those Pirates, Garrett had three hits with a HR. The next night at Shea Stadium he drove in both Mets runs in their 2-0 win over the St. Louis Cardinals. Garrett's 6th inning triple off reliever Al Hrabosky, helped Jon Matlack to the four hit shutout. The win put the Cards three behind the Mets as they began to fade away from the tight pennant race. Garrett came back to drive in two more runs the next night as well, Harry Parker got the win & Tug McGraw the save. 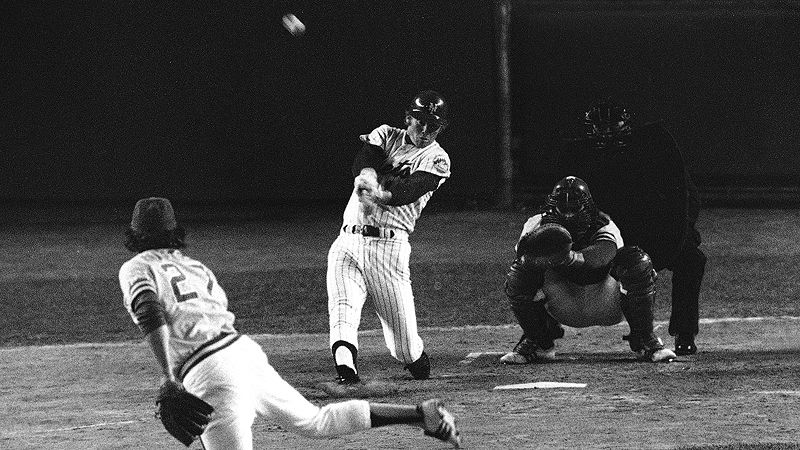 Although the Mets lost to Montreal Expos on September 26th, Garrett hit a three run HR, bringing in all the Mets runs. He closed out the year on a nine game hit streak, hitting safely in 12 of 13 games. In that time Garrett had seven multi hit games with ten RBIs & 13 runs scored. The Mets clinched the NL East title on the last day of the season at Wrigley Field in Chicago. At third base in 130 games, he had a rough time, making a career high 22 errors (4th most in the NL) posting a .942 fielding %. 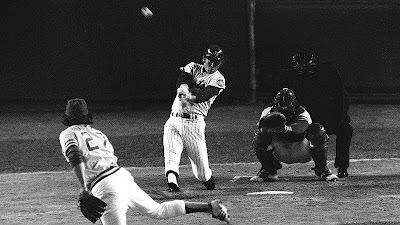 1973 NLCS: In the 1973 NLCS against the Cincinnati Reds, Garrett played in all five games but only got two hits in twenty three at bats. One of his biggest heroic acts was coming over from third base & being the first guy to tackle Pete Rose during his brawl at second base with Bud Harrelson. The fight broke out after the third out was made after the top of the 5th inning, during Game #3. In that game Garret was 0-4 with an RBI sac fly in the second inning. The run put New York ahead 2-0 in a game they would win 9-2. In Game #5 at Shea Stadium he led off the 5th inning with a double off Jack Billingham. 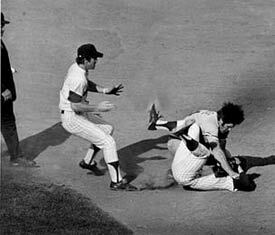 He then scored on Cleon Jones double to put the Mets ahead & break the 2-2 tie. The Mets scored four runs in the inning & never looked back clinching the NL Pennant. drove in a run. 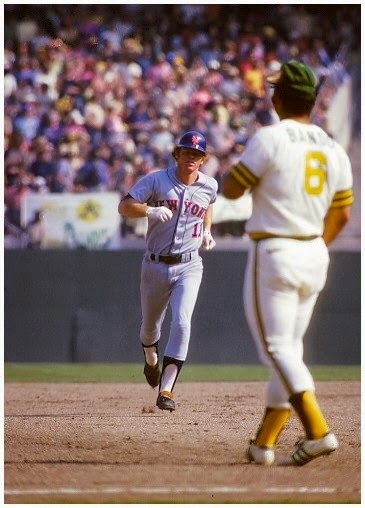 1973 World Series: In the World Series against the Oakland A's, he hit only hit .167 (5 for 30), but walked five times & hit two HRs driving in two runs. His first HR came in Game #2 at Oakland, a solo shot off Vida Blue in the 3rd inning. In Game #3 at Shea Stadium, he hit a leadoff HR in the bottom of the first inning off the A's Catfish Hunter. It was one of three different Game Three lead off HRs in Mets World Series history. 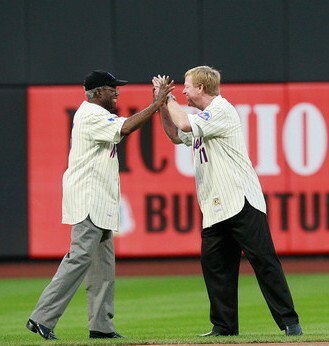 Tommie Agee was the first to do it in 1969 at home & then later Lenny Dykstra did it in 1986 at Fenway Park in Boston. In Game #4 Garrett led off the Mets first inning, with a base hit off Ken Holtzman, he would then score on Rusty Staub's three run HR. Garrett would also strike out eleven times in the Series, tying Milwaukee Braves Hall of Famer, Eddie Mathews 1958 World Series record. In Game #7, Garrett faced Oakland's reliever Darold Knowles in the top of the 9th inning, representing the tying run. Garrett came up with two on & two out, but made the last out of the Series, popping up to short stop Bert Campaneris. During the off season he hurt his shoulder while horseback riding in Tennessee. Although it bothered him when he threw to first base, he played through the pain in a career high 151 games in 1974. The year started out slow slumping to a .149 batting average at the end of May. Although he did show power in the first month, as he had hit five HRs with 10 RBIs by May 4th. 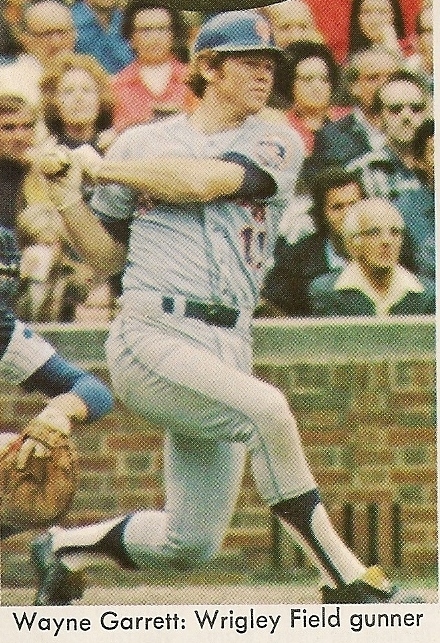 On June 8th, in the top of the 15th inning at the Houston Astrodome, Garrett drove in the winning run with a ground out scoring John Milner. In July he slumped, driving in just one run the whole month, as his average fell to .201. He rebounded to have his best month in August driving in 12 runs, with twenty hits & 26 walks. He enjoyed a streak where he hit safely in 15 of 20 games. On September 8th he hit an 8th inning game winning HR in St. Louis off the Cardinals Lynn McGlothen. On September 21st he hit a three run HR off veteran Juan Pizzaro in the 7th inning, leading to a 4-3 win over the Pirates. On September 20th he hit his fifth HR of the month, another three run shot helping in a 5-3 win over the Phillies. He finished the year batting .224 with 13 HRs (third on the club) 14 doubles a .337 on base % and 53 RBIs. He led the team in walks with a career high 89 (10th in the league). He was the fourth highest rated third baseman in the league, with a .956 fielding % turning over 31 double plays. 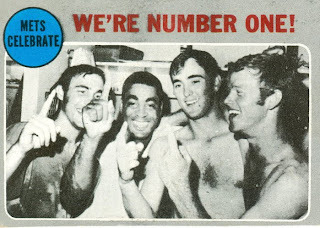 That year the Mets finished with a losing record for the first time since 1968. In 1975 the Mets acquired a player they had sought out for years, to be their third baseman; the Brooklyn born veteran Joe Torre. 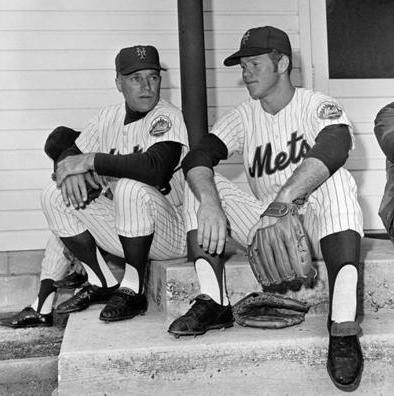 A deal to get Torre fell through in 1969 after the Mets refused to part with their top pitching prospects. Torre would see action in 83 games at third, as well as play at first base. Garrett would still play in 95 games at third base posting the second best fielding % of all NL third baseman (.966%). At the plate he started out hot, batting .321 the first month of the season. In the middle of May he drove in runs in four straight games he played in, leading the club to wins in three of the four games. On May 26th he hit a walk off three run HR off one of the league’s best pitchers, the Los Angeles Dodgers; Andy Messersmith. His hitting tailed off as the year went on, having the most run production in the month of August when he drove in 14 runs. For the year he raised his average over 40 points to .266, drawing 82 walks which gave him a .380 on base %. In 107 games he hit 6 HRs 12 doubles with 34 RBIs, & 49 runs scored. 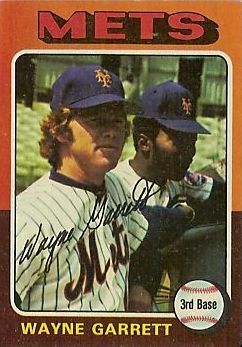 By 1976 Garrett's days were numbered, as the Mets new manager Joe Frazier, went with a young rookie named Roy Staiger who had drove in alot of runs at AAA Tidewater where Frazier was his manager. Staiger played for one season but never made it as the third baseman of the future. After 80 games in 1976, Garrett was hitting only .223 with four HRs & 26 RBIs through July 21st, when he was traded along with Del Unser to the Montreal Expos for Jim Dwyer & Pepe Mangual. Garrett must be remembered to down as one of the most reliable Mets in history, as well as one of their better third baseman. Mets All Time List: Garrett is third on the Mets all time list with games played at third base (behind David Wright & Howard Johnson). He is 16th on the All time Mets list in games (883) fifth in walks (443) #13 in triples (20) #16 in runs scored (393) & #22 in hits (667). For the Mets Garrett also had 55 HRs, 295 RBIs & 93 doubles & batted .239. 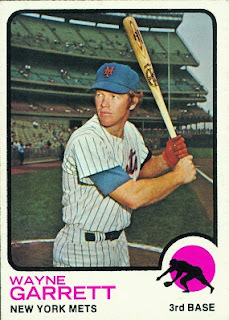 Post Mets Career: For the rest of the 1976 season with Montreal, he hit .243 as the Expos main third baseman. In 1977 he played in only 68 games, due to injuring his knee when sliding into second base. The injury shortened his career due to internal damage. That year he batted .270, with two HRs and 22 RBIs. He was traded to the St. Louis Cardinals in mid 1978 finishing his MLB career there batting .333, in 63 at bats. Japan: In 1979 he went on to play in Japan for two years with the Chunichi Dragons. Career Numbers: Overall in his ten year MLB career he batted .239 with 786 hits 107 doubles 22 triples 61 HRs 340 RBIs 561 walks & a .350 on base %. At third base he posted a .956 fielding % with 148 errors in 2158 chances in 792 games. He also played in 195 games at second & 32 games at short. Retirement: In 1989 Garrett played in the Senior League, batting .246 for the Explores under manager Clete Boyer. 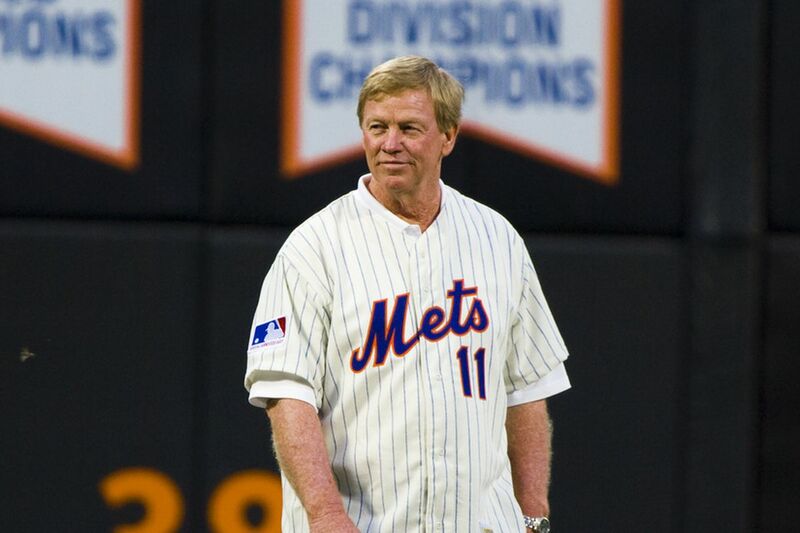 Honors: Garrett was on hand for the closing ceremonies of Shea Stadium in 2008 and for the 40th anniversary of the 1969 Amazing Mets Championship team at Citi Field in 2009.